Released in 2015, Windows 10 has been quickly reviewed on various technology sites. In general, user experience has been improved a lot in windows 10. And some simple but useful features have been added or improved in this version. It allows you to record screen and audio, manage files of your phone and take screenshot easily. No matter you need to share the amazing features to others or come across any problems in using this OS, you can use screenshots as a great medium. Besides, screenshots also enable you to share funny conversations and news with friends. So, in this article, we are going to enumerate some great ways for you to take screenshot in Windows 10. This tool is a free online screenshot application which allows you to screenshot a specific region, a current window, as well as the full screen. And you can also set your own hotkeys or set a delay time for taking screenshots. Another advantage of this tool is that it allows you to take screenshot and annotate it directly on the screen without going to a standalone image editor. You can add lines, arrows, text to the screenshot to mark the important parts and use the blur pen to cover sensitive or private information. It features rich editing options to inspire your creativity in customizing the screenshot. Once done, you can save, copy, email, upload or share the screenshot directly in seconds. Here are the steps for you to capture screen on Windows 10 with this application. Go to the page of this tool, click on the orange “Take Screenshot” button and run Java applet to load this application. When the program pops up, hit the camera icon on its interface. Then, you mouse cursor will turn into a crosshair. Click, hold and drag your mouse to select an area and then release the mouse to confirm the screenshot region. You can now annotate the screenshot with drawing options on the horizontal toolbar. Lastly, hit the last disc icon on the horizontal toolbar to save the screenshot on your local disk. Alternatively, you can also choose to upload it to the free cloud space provided by the developer or just share it to social networks like Facebook, Twitter, etc. This tool also has a pro version which has even more screenshot modes for you to print screen on Windows 10. There are all-in-one, menu, scrolling window, free-hand and so on. Apart from that, the pro version provides a task scheduler, an advanced image editor and a powerful screen recorder which supports real-time editing. You can enjoy all those functions by downloading it now. The simplest way to take screenshot in Windows is pressing the Print Screen (also “Prt Sc” or “PRTSC” on some keyboards) key. In Windows 10, once you’ve pressed that key, a screenshot of the full screen will be automatically saved to the “Screenshots” folder in Pictures library. If that doesn’t work, just try the combination of “Win + Print Screen” keys or “Fn + Win + Print Screen” keys on some laptops. Though this method is very simple, you can only get a screenshot of the full screen with no direct editing options. Another way to screenshot in Windows 10 is using a built-in utility called Snipping Tool which is located in the Accessories folder. You can also quickly find it by typing “Snipping Tool” into the search box besides the Start button. 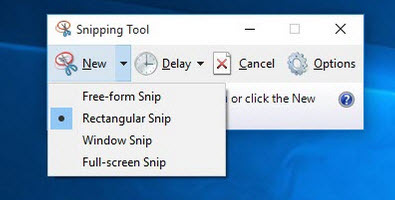 This tool offers four screenshot modes: Free-form Snip, Rectangular Snip, Window Snip and Full-screen Snip. In Windows 10, it even allows you to set an interval for taking screenshot, which is very useful for capturing tooltips, menus and the like. In addition to the above solutions, there are also some other tools that you can use, such as Snagit, Faststone Capture, GreenShot and PicPick. Snagit offers various screenshot modes and advanced steady image editor. Faststone Capture allows you to choose dpi for the screenshot and save images as PDF files. GreenShot and PicPick are relatively simpler than the first two but also good enough for common users to screenshot Windows 10. This post gives you an overall guide on how to screenshot in Windows 10. If you just need a screenshot of the full screen, then the “Print Screen” key may meet your need. But if you have more requirements like image editing, instant sharing or capturing screen with delay, then Free Screenshot Capture is your optimal choice.